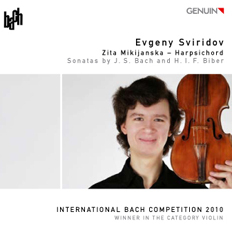 “If it is going to be Baroque – then not old hat!” said the young Russian violinist Evgeny Sviridov, and on his debut recording with GENUIN featuring Johann Sebastian Bach and Ignaz Franz Biber, Sviridov performs with such vividness and spark in a performance which breathes with vigor, it seems like the music had just been invented. The times of “Romantic verve” are over, when violin virtuosos rendered Bach with a consistently broad-stroked vibrato and hefty tone without delicate phrasings, subtle agogic accents, daring handling of melodic lines which are hallmarks of the 2010 Leipzig Bach Competition winner’s performance! Bach, Biber, Sviridov: the true Romantics! "Without the knowlegde of his mentors, he entered the 2010 Bach Competition in Leipzig and won. Listening to the CD, it is easy to understand why." Review in the magazine "Early Music Review", October 2011.